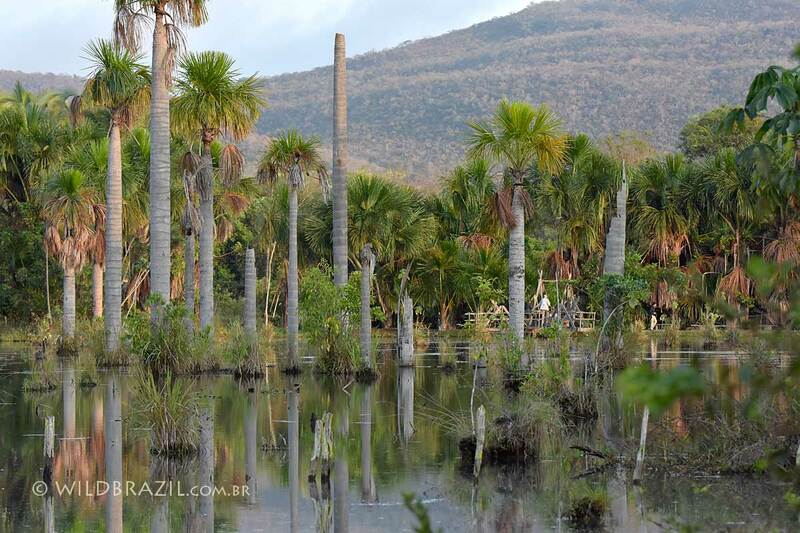 In the quiet village of Bom Jardim (Nobres province) we will visit a wonderful lagoon dotted with numerous palm trees. 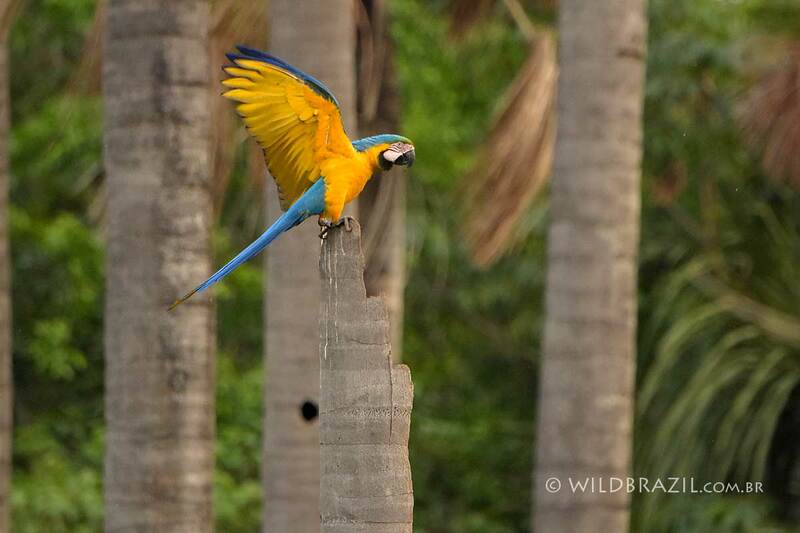 At sunset we'll wait for many Blue-and-yellow macaws coming to their nests inside of the palms trees. 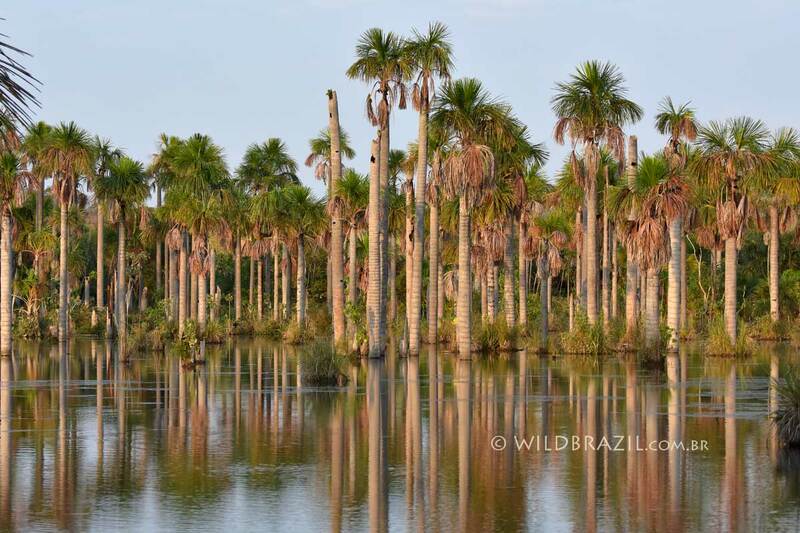 We will visit the lagoon twice, at sunset and at sunrise when the macaws are more active. It's possible also to observe and photograph many other bird species, such as Red-bellied macaw, kingfishers, woodpeckers, ibis, egrets, owls and more. Bom Jardim is famous for its wonderful crystal spring water streams that flow in a lush forest. 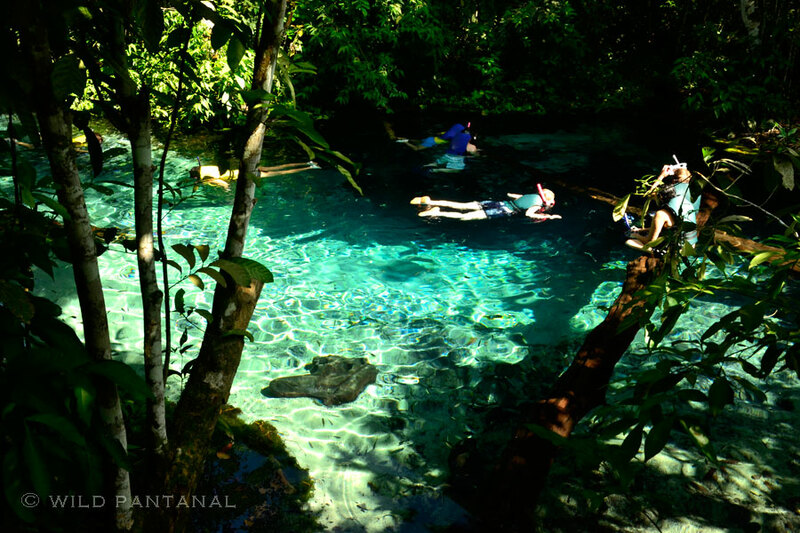 Here you will swim and snorkel in a amazing natural aquarium and then swim helped by the flow of a river for about 1 km, together with lot of different species of colored fish. A really amazing experience, don't forget your action camera! 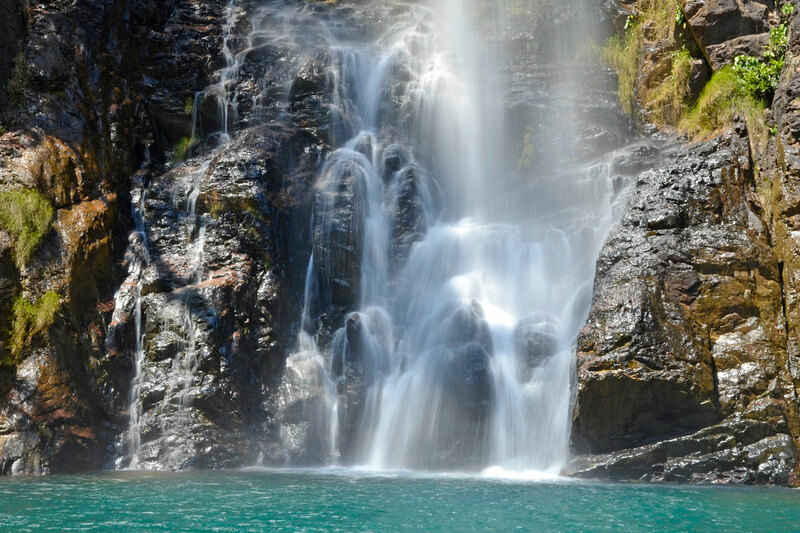 At Bom Jardim you can enjoy also other attractions, such as the wonderful waterfall Serra Azul and the Quebó Cave. Departure from Cuiabà airport / hotel in the first afternoon. 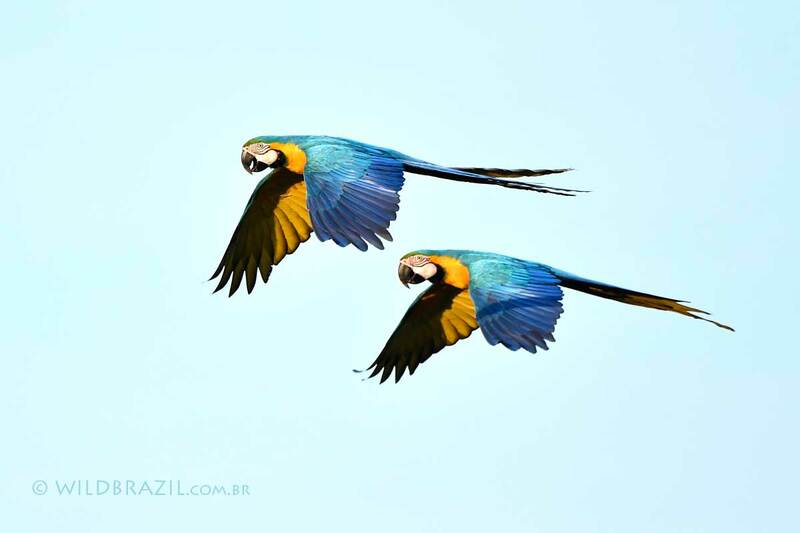 Arriving at Bom Jardim (2 hours), accommodation in a beautiful pousada where, in the garden you can observe birds such as parrots and maybe macaws. 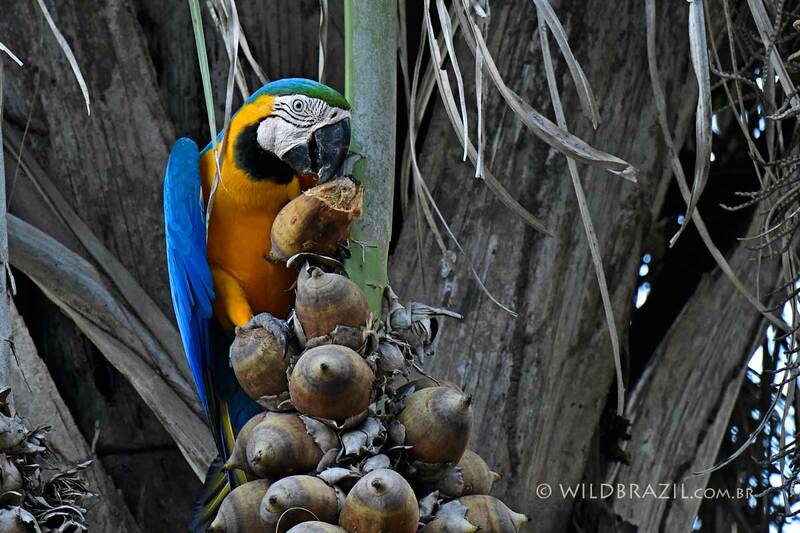 Visit the Lagoon of the Macaws, where you will have the opportunity to take stunning pictures of blue-and-yellow macaws and many other birds such as red-bellied macaw. Back to the lodge, dinner and overnight. 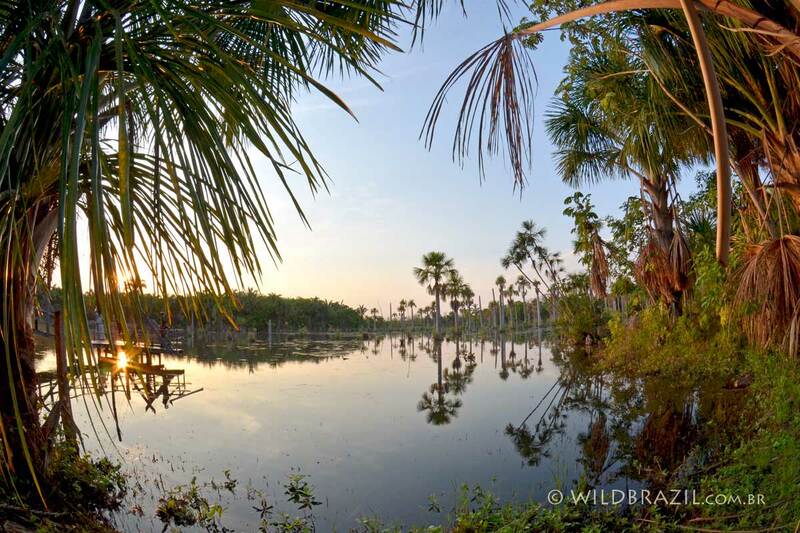 Early in the morning we will return to the Lagoon waiting for the macaws wake up and take pictures of their flights and evolutions. Return to the hotel for the breakfast. Transfer to the Aquario Encantado. 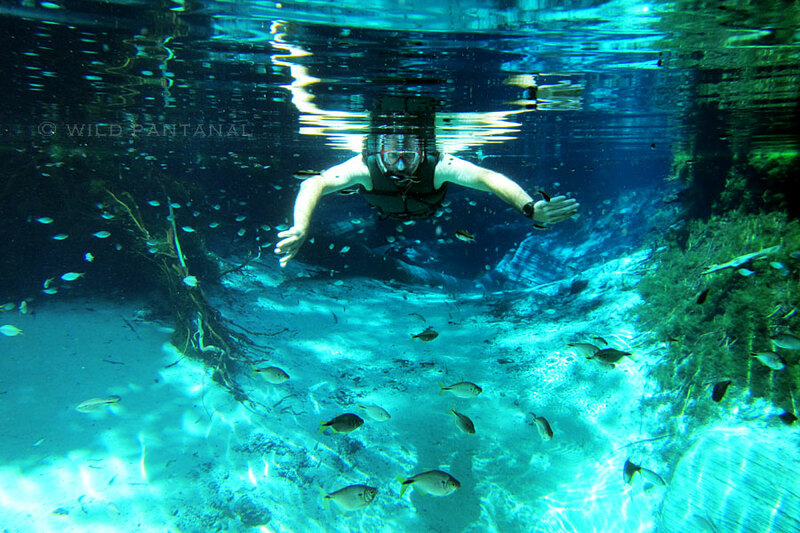 After wear the equipment for the snorkeling, life vest, goggles and snorkel (the equipment is cleaned and disinfected after every use), we will walk in a forest where flow rivers characterized by clear spring waters. 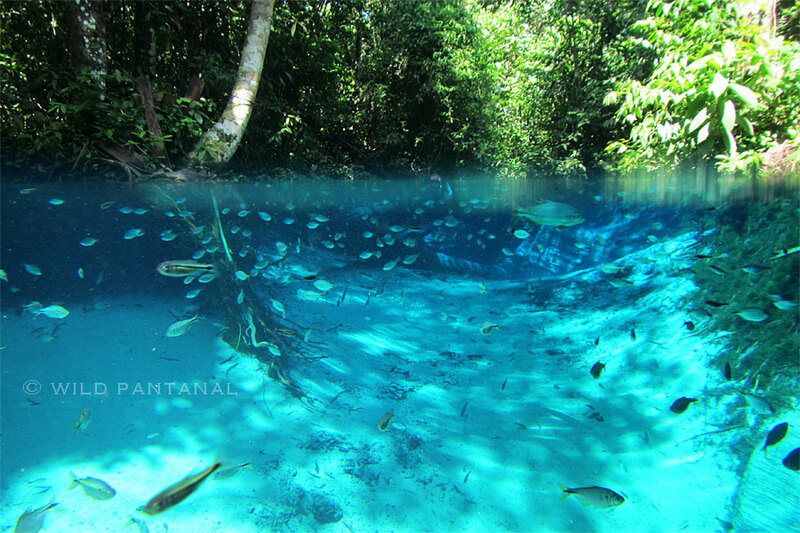 Here we will swim and snorkel in a wonderful natural aquarium together with lot of fishes, helped by an expert guide (it's forbidden to use insect repellent and sunscreen). Lunch. After lunch departure to Cuiabá airport / hotel. End of the tour or extension to other destination. 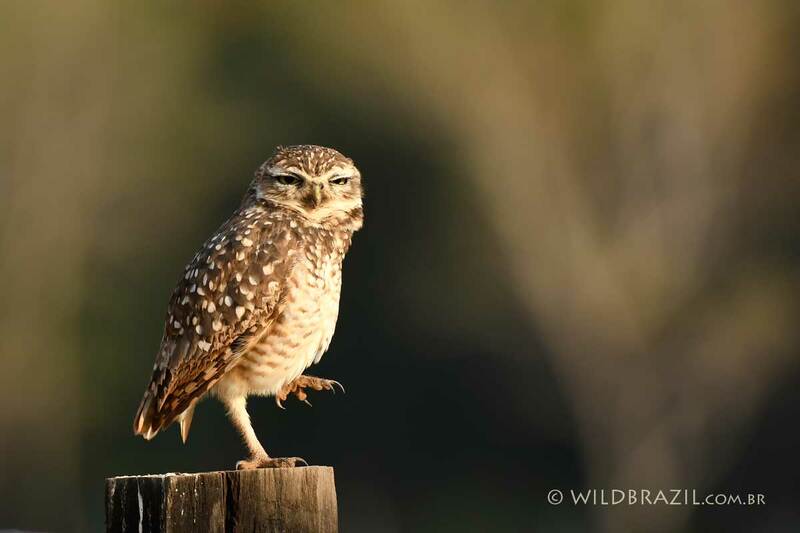 Today we will visit the Serra Azul waterfall that is located at approximately 20 km from Bom Jardim, during the transfer it's possible to encounter armadillos, red-legged seriema, greater rhea, parrots, hawks, owls and more bird species. The tour start at the waterfall headquarter with the assistance of a guide. After equipping, guests will walk on a trail of about 800 meters with a staircase of 470 steps. The walking can be a bit tiring for those who are not accustomed to the practice of trails. After 800 meters, you will arrive at the waterfall that is 46 meters high, 30 meters in diameter and 6 meters deep. You can stay there for a max of 50 minutes, swimming, snorkeling, appreciating the landscape, fauna and flora. After that time, it's possible to returne back making either again the longe staircase, or by a zipline. The zipline is about 700 meters long and 50 meters high, and it's very exciting, totally safe and well worth it! 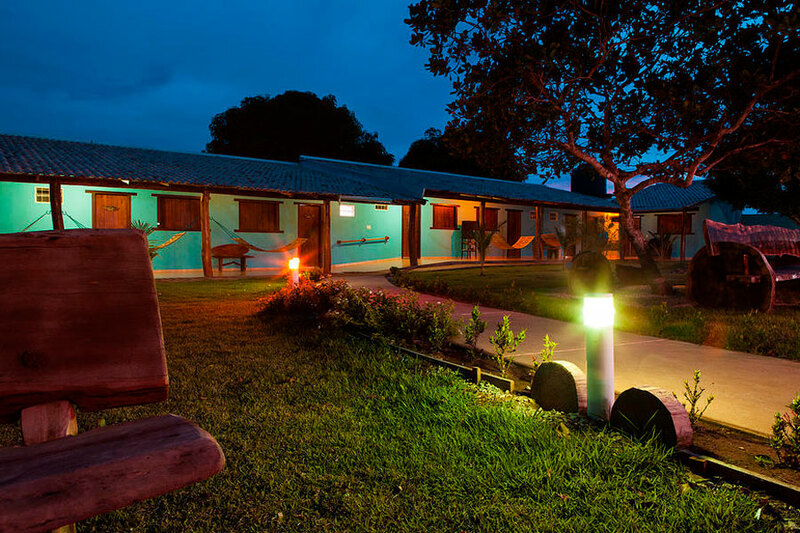 A comfortable lodge with access to a cristal water river by a beautiful trail in the forest. 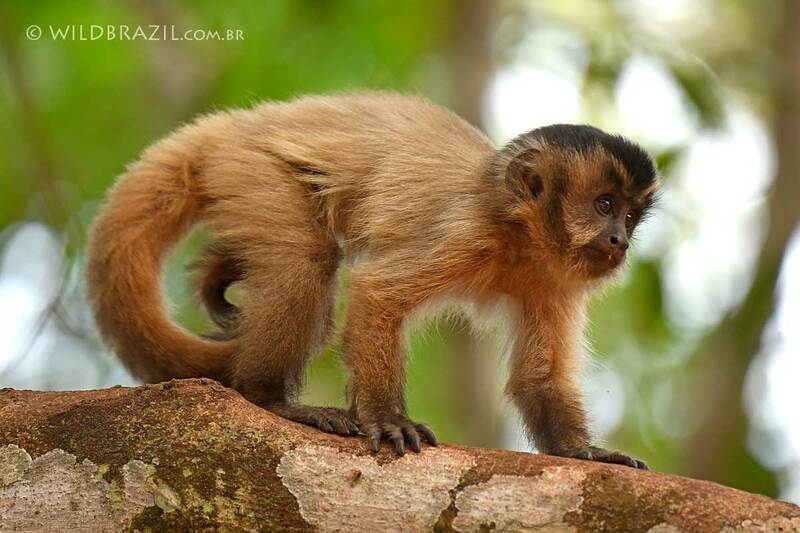 In the surroundings you can contemplate a rich fauna and flora with the possibility to encounter capuchin monkeys, macaws and lot of other birds. 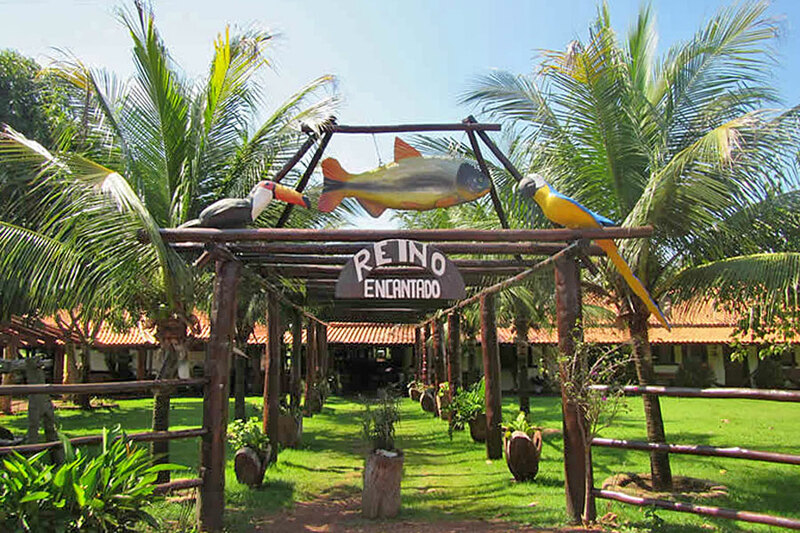 A beautiful and very comfortable pousada located in the centre of Bom Jardim, in the garden you can observe birds like parrots and sometimes macaws.